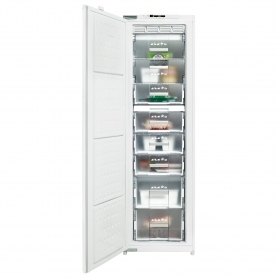 The Blomberg 036FNM1541I freezer gives you plenty of space to pack in groceries and delicious treats. This tall, upright freezer also comes with some great features, and has an A+ energy efficiency rating. Offering a net capacity of 196 litres, the 036FNM1541I is perfect for families - all this space allows you to take advantage of those bulk supermarket deals. With eight compartments for storing all your frozen goods, you can arrange everything just the way you like it, and the transparent Freezer Fronts make it easy to find what you’re looking for. 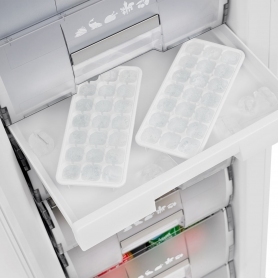 This Blomberg freezer also comes with a slimline ice tray, ideal for making and storing ice cubes. The 036FNM1541I is a tall freezer with a built-in or integrated white design and electronic display, allowing it to fit seamlessly into your kitchen. The door is reversible, meaning you can attach the hinges on either side to give you freedom when positioning the appliance. Blomberg have equipped the 036FNM1541I with a Fast Freeze function, perfect for fresh produce you’re just adding to the appliance. Freezing food items quickly locks in more nutrients, and helps preserve the texture. Food is expensive, so you want your freezer to be reliable. The 036FNM1541I offers you protection when power cuts occur, keeping food frozen for up to 15 hours after power is lost. 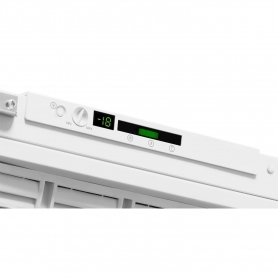 The 036FNM1541I also has a handy high-temperature warning light, which will be triggered if the internal temperature of the appliance begins to rise. This offers great protection in case you accidentally leave the freezer door open. If you want to have the freezer somewhere other than your kitchen, such as a garage or outbuilding, this Blomberg model is perfect. Most freezers stop working when the environment becomes too cold, making them unsuitable for use outside of your home. The 036FNM1541I can however continue to operate in temperatures as low as -15°C. At regular intervals, freezers are meant to be manually defrosted. 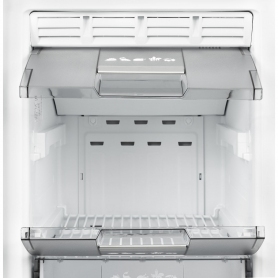 This Blomberg freezer saves you this hassle by doing it for you automatically. It helps prevent a build-up of frost and ice inside the appliance, which can negatively affect freezer performance and take up valuable storage space. With such a great range of features, the Blomberg 036FNM1541I is the perfect addition for your family.Order yours today.